Timeless and classic, our triple hairline thank you note framed in regent blue prides itself on i..
A note graced with elegant flora fit for, well, a queen. Simple and delicate, it welcomes corresp..
A little exotic and entirely luxurious, this hand engraved note features a shimmering peacock fea..
Trumpets sound and people bow as this gold hand-engraved thank you note, wrapped in sumptuous ecr..
How does your garden grow? With raspberry-hued vines oh so lovely to the touch. Our thank you not.. Sometimes the simplest words are the most meaningful. This elegant note with "Thank You" blind em.. The creak of an opening mailbox? Music to our ears. Especially if this lovely note, with a deligh..
Charmingly illustrated in kona and moss, a bicycle with a basket resting against a post lends a c.. The apple of your eye will be so pleased to be acknowledged by our sweet illustrated note. Printe..
Their gift delighted you. Now return the favor with an urbane thank you note that artfully expres.. 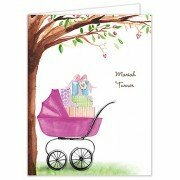 This lovely baby shower thank you note from the Bonnie Marcus Collection features a pink bassinet..